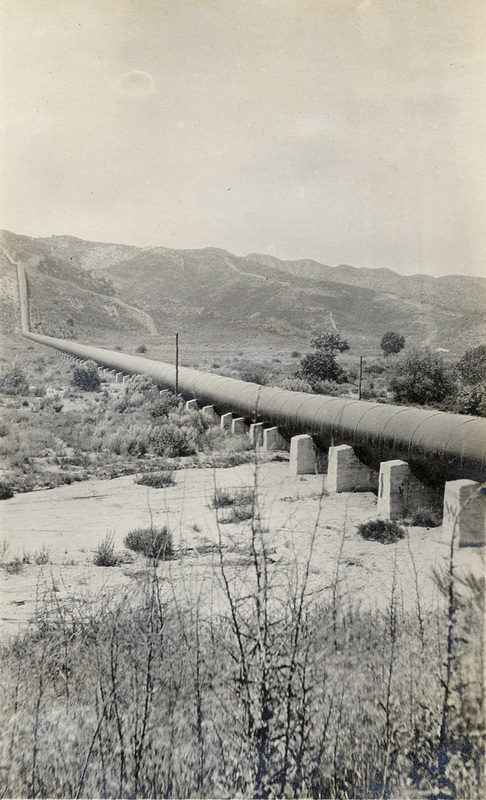 Los Angeles Aqueduct pipeline, in Saugus (seen from Bouquet Canyon Road, looking west), bringing Owens Valley water to Los Angeles, completed in 1913 and seen here in 1914. Photo taken during a June 1914 auto tour by persons unknown, who traveled from Los Angeles to Lake Tahoe by way of Sacramento in a 1910 Ford and a 1911 Maxwell. About the Los Angeles Aqueduct. In the early days of the pueblo of Los Angeles, the city water supply was obtained from the Los Angeles River. Water was brought to the pueblo from the river by way of a series of ditches called zanjas. The main ditch was called the Zanja Madre (mother ditch). By 1868, the population of the pueblo had grown to between 5,000 and 6,000 people. At that time, the city entered into a contract with a private water company, the Los Angeles City Water Company, to lease the city's waterworks for a 30 year period to provide water to the city. In 1875, Fred Eaton became superintendent of the water company. He hired Irish immigrant William Mulholland in 1878 as a zanjero (ditch tender). Although he had no formal schooling, Mulholland proved to be a brilliant employee, who taught himself engineering and geology. Mulholland became friends with Eaton and quickly moved up the ranks of the Water Company, becoming Superintendent in 1886. By the turn of the century, the population of Los Angeles had grown to more than 100,000 people. It was becoming obvious that the Los Angeles River would not have enough water to supply this growing city in the future. Eaton had traveled to the Owens Valley, east of the Sierra Nevada Range, in the early 1890's and came up with a gradiose idea of diverting water from the Owens River to the increasingly thirsty city of Los Angeles 233 miles away. In 1902, the City of Los Angeles took over the city's water supply and the Bureau of Water Works and Supply was formed with Mulholland continuing as Superintendent. Eaton convinced Mulholland to travel with him to see the Owens Valley, which they did by buckboard, passing through the Newhall-Saugus area in 1904. Mulholland was convinced by Eaton during this trip in 1904, and hatched an idea to build an aqueduct between the Owens Valley and Los Angeles. But to accomplish this would first require buying up land and water rights in the Owens Valley. The residents of the Owens Valley, however, had other ideas. They were looking forward to a reclamation project sponsored by the federal Bureau of Reclamation. Eaton, with the help of his friend and local chief of the Reclamation Service J.B. Lippincott, began buying up land in the Owens Valley under the pretense that the land would be used for the reclamation project. By July 1905, Eaton had bought up enough land to secure the land and water rights to build the aqueduct. The Los Angeles Daily Times headline of July 29, 1905 would proclaim "TITANIC PROJECT TO GIVE CITY A RIVER. Thiry Thousand Inches of Water to be Brought to Los Angeles. Options Secured on Fourty Miles of River Frontage in Inyo County...Stupendous Deal Closed." 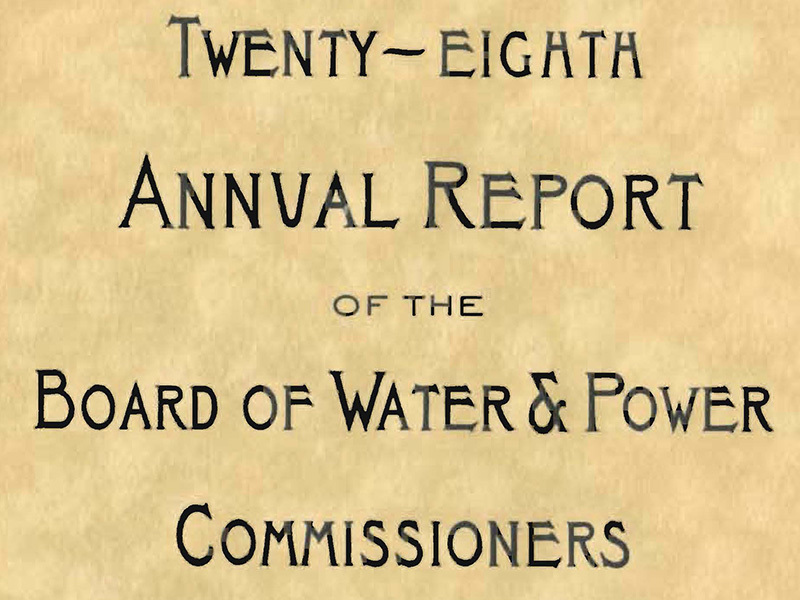 Bond issues were passed by the voters in Los Angeles in 1905 to finance the purchases made by Eaton and in 1907 to finance the construction of the aqueduct. Mulholland began construction of the aqueduct in 1908. It would prove to be an engineering marvel extending 233 miles from the Owens Valley to Los Angeles with the water traveling the distance purely by gravity without the need for pumping systems. The project also featured the 5 mile long Lake Elizabeth tunnel. The aqueduct would pass through San Francisquito, Bouquet, and Soledad canyons on its way to the terminus in the San Fernando Valley. Mulholland miraculously completed the project on time and in budget by 1913. He became an absolute hero to the City of Los Angeles (but reviled by the people of the Owens Valley for decades to come). The aqueduct was completed with it's terminus at the southern end of the Newhall Pass with a cascade of water flowing down the mountainside in what would become present day Sylmar. The original cascade of water can still be seen when traveling on Interstate 5 through Sylmar in the San Fernando Valley. On November 5, 1913, over 40,000 Los Angeles residents came to the San Fernando Valley to see the first water from the Owens Valley complete the journey to Los Angeles. The city's hero Mulholland presided over the ceremony and instructed the water gate to be opened with the famous words "there it is, take it." The November 6, 1913 issue of the Los Angeles Times proclaimed: "GLORIOUS MOUNTAIN RIVER NOW FLOWS TO LOS ANGELES." As part of the Aqueduct opening ceremonies, Exposition Park in Los Angeles was dedicated the next day on November 6. Alas, Mulholland was to experience the proverbial "rise and fall" story. His hero status would forever be tarnished by the St. Francis Dam Disaster which occurred 15 years later in March, 1928. But on a fine November day in 1913, Mulholland was truly on top of the world. LW2189: 9600 dpi jpeg from original print | source & current location unknown.